15 Best Winter Activities in Arkansas! One thing you will experience here in the Natural State is all four seasons. So, what do you do as an Arkansan when Old Man Winter dumps multiple feet of snow, ice, and other winter weather on your neck of the woods? The answer is plenty! From holiday festivals to the witnessing the most talented symphony orchestras around, Arkansas will keep you busy this winter. 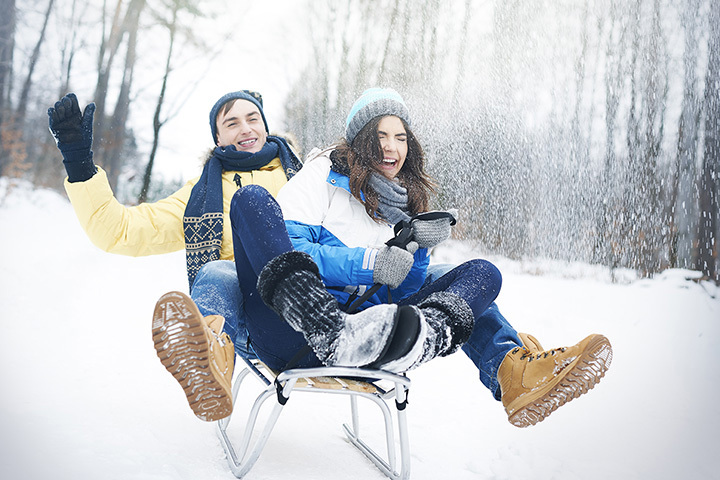 Here are the 15 best activities to do this winter season. There are 52 state parks in Arkansas and 12 of those have cabin rentals available. From more modern designed spaces to rustic structures made of log and stone, guests get to choose the kind of feel they are going for. The cabins feature kitchen amenities and cozy fireplaces to keep you warm on a harsh winter evening. One of the most widely supported Arkansas winter activities takes place, for the most part, at Bud Walton Arena at the University of Arkansas in Fayetteville. Few Arkansans have survived a winter without a visit to cheer on the beloved Razorbacks as the basketball team takes the ball to court. Each holiday season the Lawrence Plaza in Bentonville, Arkansas, transforms itself into a popular spot beloved by locals. This well-known summer splash park converts into an outdoor ice skating rink during the Arkansas winter months. So lace up your skates and get ready to practice those moves. Like many other Southern states, Arkansas is a land of hunters and deer meat-eaters. One of the best winter hunting spots is in the Arkansas Delta less than a mile north of the Helena River Park. Owned by the Arkansas Game and Fish Commission, the Buck Island Wildlife Management Area is only accessible by boat. In case you’d forgotten (because we all forget sometimes), not only has the bald eagle been the national bird and the national animal for the United States of America for over 230 years, it also served as a spiritual symbol to the native people of this land for much longer. During the winter season, the ancient Arkansas Ozarks become an uncommon home to wintering eagles. As bird-watching gains popularity in the Natural State, the Ozark Mountains continue to annually provide the perfect setting to view this threatened species in flight. You won’t forget a glimpse of this majestic creature: the unmistakable adult bird has a 10 to 12-foot wingspan and sports a white head and tail. One of many Altitude Trampoline Parks across the country, it is seemed the “world’s premier” facility and fun center. To escape the cold of winter, head inside and jump around on the park’s selection of trampolines to warm up. Suitable for all ages, the park also offers dodgeball, fitness classes, and even competitive jumping, as well as parties and group events. One of the Arkansas’ favorite winter activities is finding a spectacular drive-thru light display. Among the best are Little Rock’s Christmas at the Capitol, Eureka Springs’s Passion Play Light Display, and Pine Bluff’s Annual Enchanted Land of Lights & Legends. A visit to the Arkansas Symphony Orchestra is a lesser known, yet popular winter activity. Under the musical direction of Philip Mann and after recent renovations, this holiday tradition is moving back to Little Rock’s Robinson Center this season’s performances. Sponsored by the Heritage League of Siloam Springs, the city of Siloam Springs has been hosting an annual Christmas parade for over 35 years. Year after year this local tradition brings this small community together with spirit of Christmas. Get together with your loved ones for this event that everyone can enjoy. One of the best winter activities that every Arkansan has experienced is the lighting of the Square. Each year, entire communities are known to gather together in one accord as they begin the winter season. A few of the most well-known locations include: Huntsville’s Christmas Lighting on Polk Square, Fayetteville’s Lights of the Ozarks, and Bentonville’s Winter Wonderland. Yearly, from mid-November to late February, Arkansas residents can witness wintering trumpeter swans in this famous spot. For years, people in the area have been granted the beautiful experience of watching these beautiful birds. It’s a majestic sight. Held annually for the last five years, ComiCon-way is gaining popularity as one of the best winter activities in Arkansas. This epic gaming, anime, comic, and sci-fi convention is presented by the Faulkner County Library in the Conway Expo Center. Meet some of the most legendary people in the comic industry, dress up, and enjoy yourself. You won’t want to miss this! Located in Little Rock’s Chenal Valley, the Wildwood Park for the Arts is home to the area’s one-of-a-kind botanical gardens and to the Lucy Lockett Cabe Festival Theatre. Wildwood’s annual Lanterns! Winter Festival is held in the deep-winter and celebrates the first full moon of the lunar New Year. The annual Mena Christmas Gift Art Show, held each winter in the Mena Art Gallery in Mena, Arkansas, is a favorite among Arkansas winter activities. When the cold keeps you inside, have yourself a little art-retail therapy and shop the variety of unique (and affordable!) Arkansas artworks. The Festival of Trees at the Bay and Light Up the Bay, presented by the Fairfield Bay Chamber of Commerce, are a traditional launch to the areas holiday season. This magical experience is just one of the many, wonderful winter activities in Arkansas.